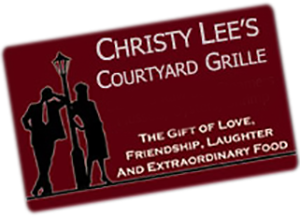 Please fill out the information below to purchase a gift certificate to Christy Lee's Courtyard Grille. Our staff will put your Gift Certificate in the mail. If you have any questions, call us at 706-946-5100 or contact us using our web form. We look forward to serving you in the near future. 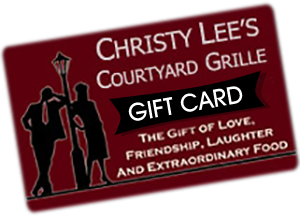 Please fill out the information below to purchase a gift certificate to Christy Lee’s Courtyard Grille. Our staff will put your Gift Certificate in the mail. If you have any questions, call us at 706-946-5100 or contact us using our web form. We look forward to serving you in the near future.